With the impressive overall quality of food onboard Celebrity Reflection, there is little need to spend extra on specialty dining unless you feel like a treat. Even Oceanview Cafe and Grill, the cheerful buffet venue on Deck 14, takes things to a new level with tasty international dishes that belie the restaurant's casual surroundings. Celebrity didn't reinvent the wheel when it comes to dining on Reflection, sticking instead to options familiar to those who have cruised before. In Opus, the main dining room, passengers can choose from traditional dining (early or late seating), or the more flexible Celebrity Select Dining, which allows them to eat there any time between 6 and 10 p.m. Among the specialty dining options, which mostly come with additional fees, Qsine remains a popular choice among passengers, though our pick is Murano, which offers deliciously rich -- and playful -- French cuisine. 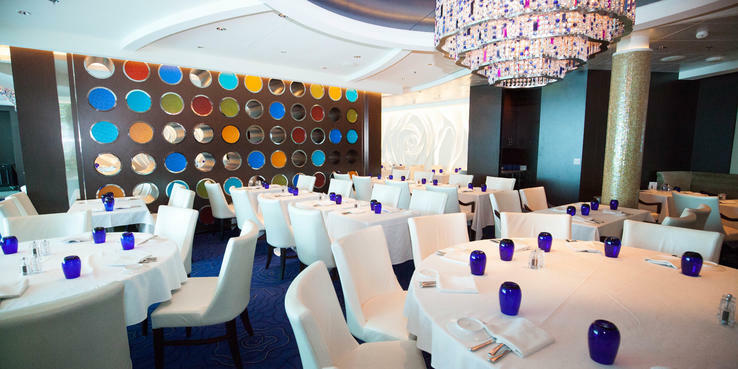 Opus is the ship's main dining room, meaning it's the largest venue onboard and offers seated dining. It's an elegant venue, decorated in deep browns and silvers, with bright white tablecloths and crystal as far as the eye can see. The vast space is stunningly designed, though tables are a bit too close together making private conversation difficult. The menu mostly appeals to a North American palate, with some international and upscale options. We found it helpful to ask our waiter what he recommended; his suggestions were usually spot-on. Lunch is served on sea days only. Vegetarian and healthier options are identified on the menu, but if you have specific dietary needs (vegan- or gluten-free), discuss them with the maitre d' before your first meal and ask specific questions about the menu items you select. Oceanview Cafe and Grill is Reflection's buffet area, serving breakfast, lunch, snacks and dinner. The menu changes each day, but you'll find areas like a cooked-to-order eggs and omelet station, a salad bar including a mix of lettuce and toppings and a cheese bar that includes American standards like cheddar and colby in addition to Brie, Gouda and the like. You'll also find international options like Mexican, Indian and Asian, as well as pizza. Indian selections are particularly good, with chicken masala and tandoori chicken all having just enough kick. Live cooking stations with customized pasta options and a selection of sauces are featured as well as made-to-order stir-fries with meat, seafood, spices and sliced vegetables. Tables are generously spaced, which, combined with floor-to-ceiling windows, gives a relaxed, open feel to this popular dining venue. Drink service is speedy. The outdoor Mast Grill serves up burgers, hot dogs and fries. The AquaSpa Cafe, located in the Solarium, is available to those aged 16 and above and provides healthy and convenient breakfast options, such as granola and fruit, and salads, along with made-to-order dishes for lunch. Upcharge options -- yogurt parfaits, for example -- are available. The cafe also serves tea, coffee and juices. Only passengers staying in suite accommodations can dine at Luminae. The space is elegant yet contemporary and large picture windows let in plenty of light. Luminae never feels busy, even when it is full. Breakfast is the same each day, while lunch offers two rotating menus, which can become a bit monotonous. Dinner is a different story with a new menu each day, plus the option to order from the main dining room menu. But it's the service that lifts Luminae. With a team of highly trained and attentive wait staff attuned to passengers' likes and dislikes, it is almost precognitive at times. Passengers in AquaClass cabins or suites will eat at Blu, a private restaurant serving lighter, spa-inspired fare. Some meals are similar to those served in Opus, though the presentation at Blu tends to be more refined. If you prefer a quieter, more personal dining experience, Blu delivers, although it can lack atmosphere, particularly in the early evening. AquaClass passengers don't have to pay extra to dine here, and suite passengers may book tables on a space-available basis for free. The restaurant is otherwise off limits to regular passengers, so those traveling in groups where passengers are in other cabin categories will have to figure out alternative dining plans. Pricing was accurate at time of review. Food at Murano is rich and decadent, with traditional French dishes. Diners can order a la carte or indulge in the six-course tasting menu. There are two choices for each course on the tasting menu, and there's an option of a wine paired with each (which raises the surcharge to $89). An intimate Champagne afternoon tea is served in Murano on sea days and includes a glass of Champagne, live entertainment and some of the best scones on the high seas. If you prefer formal, fine dining, Qsine might not be for you, but this fun restaurant experience is a major hit with passengers, so reservations are required. Upbeat staff guide diners through their "dining journey," and passengers place orders on iPads. Quirky serving styles and relatively simple food make Qsine perfect for multigenerational celebrations, as there is something to suit every diner regardless of age. Meals are served family style, so if one person at your table of four selects a dish, four servings are usually brought out, regardless of whether all four people want to eat it. (Ask for half-portions to circumnavigate this.) Don't miss the chocolate tombstone cake for dessert. A prime aft location ensures this stylish yet charmingly rustic restaurant is a popular choice, especially when the ship is at sea or anchored in picturesque ports. Steaks are the star at Tuscan Grill, though pasta-lovers have plenty of options, too. Caesar salad prepared tableside adds a touch of theater. Dine early so you can enjoy the view before the sun goes down. Coffee-lovers can get their fix at Cafe al Bacio & Gelateria, which also offers extra-fee gelato and Italian ice at an adjoining stand. Cakes and other goodies change throughout the day and are free. With its comfy seats and large picture windows, it's also a delightful spot to relax in. A sushi restaurant that pairs Japanese favorites with imported beer and sakes. Part pizzeria, part open-air grill, passengers serve as their own grill masters, seasoning and cooking their meats or baking their pizzas with assistance from Celebrity chefs. If you don't want to do your own grilling, the chefs can cook everything for you. The Porch is a raw bar and seafood venue where diners can order towers, salads, soups and entrees loaded with fresh fish. Pair your meal with some of the creative sangria options. Located inside Reflection's main galley (kitchen), the 16-seat Chef's Table is separated from all the action by a glass wall so diners can watch the hustle and bustle as waiters come and go. The evening kicks off with cocktails and hors d'oeuvres inside the galley, followed by a tour and then concludes with an eight-course meal, all hosted by one of the ship's master chefs. If you have your heart set on this one, book ahead of time as it sells out quickly.